I don’t remember many first lines of books that I’ve read, but somehow I’ve never been able to forget “Stephanie is into hunks,” which is the first sentence of Judy Blume’s 1986 middle grade novel Just As Long As We’re Together. I’ve also never been able to forget that the “hunk” who hangs above Stephanie’s bed is a young Richard Gere, whom Stephanie has named Benjamin Moore after the paint brand. Throw in a supposed talking dog, an exercise video involving “gluts” and a ninth grader nicknamed Jeremy Dragon, and that is basically the complete picture of what I remember about this book from childhood. Just As Long As We’re Together is the story of Stephanie Hirsch, a seventh grader, who has two best friends. Rachel has been her best friend pretty much all her life, and Alison is new in town. As their seventh grade year unfolds, Stephanie and her friends endure the usual growing pains, including questions over whether someone can have more than one best friend. Stephanie herself faces issues surrounding her weight, her period, her parents’ troubled marriage, her brother’s nightmares about nuclear war, and of course, boys. I was a little nervous that this book wouldn’t hold up for me as an adult, but it turns out I had nothing to worry about. From that silly first line, I was hooked on Stephanie’s voice all over again, and I found myself eagerly zipping through each chapter. I was surprised by how little plot there really is, but not at all surprised that a character-driven story about friendship would be the one I would choose as a favorite. I like that the story drifts from episode to episode, slowly exploring every facet of Stephanie’s life. I like that things unfold organically, and that there doesn’t seem to be any real rush to finish the story or make an important point. Judy Blume has a talent for making the everyday seem interesting and for giving girls positive fictional role models for navigating early adolescence. I could relate completely to Stephanie, and to most of her experiences, and the fun of reading the book was really just getting to spend time with a character I really liked. It was like checking back in with an old friend after twenty years and finding she hasn’t changed a bit. 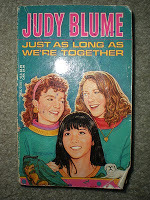 Just As Long As We’re Together is one of the tamer Blume novels, and I think it’s appropriate for girls as young as eight or nine. There is also a sequel, Here’s to You, Rachel Robinson, and both books have been combined into one volume entitled BFF, which has a much more updated cover than my old paperback edition. Despite some of the outdated references, I think the issues explored in this book are still relevant to today’s tween audience, and Blume can be trusted to handle them honestly and authentically. Lulu might love her animals, but her grandmother, Nan, who is staying with Lulu and her cousin Mellie while their parents take a trip, does not feel the same way. When the girls find a bag on the front porch in which someone has left a marigold-colored cat, Nan is adamant that the cat must not come in the house. But Lulu can never abandon an animal in need, and she is sure that with a little time and persistence, she can convince Nan to love – and maybe even keep – the adorable stray. The true testament to the quality of these books is that I, who am not an animal lover, keep coming back to them and loving them from beginning to end. I enjoyed watching Lulu's antics with her found duck egg in her classroom at school. I loved her relationship with the dog she found on the beach during vacation. And I am just as pleased by this story about the cat she finds at home, and how she comes to care for it. It's not just the subject matter that makes this series a success – it is McKay's way of getting inside the mind of her main character and her talent for describing her characters' thoughts and interactions. I love her description of Nan as “”little and snappy and quick and kind” and the way she depicts the cat: “A glow-in-the-dark orange cat with eyes like lime-green sweets. Paws like beanbags. A tail like a fat feather duster.” These simple, yet beautiful, sentences stick with readers and paint clear pictures in their minds. McKay has mastered the important art of writing sentences beginning readers can decode without sacrificing the beauty of the language. 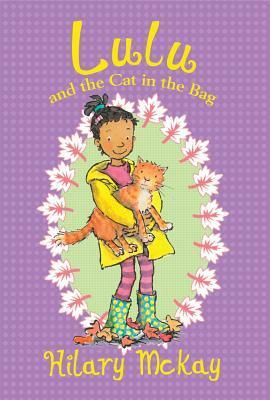 Lulu and the Cat in the Bag is another wonderful installment to the Lulu series that is sure to charm established fans and drum up some new ones. Recommend it to cat lovers, and to any little girl who wants to make a brand-new fictional friend. At a girls’ school in Sydney, Australia one beautiful afternoon in the late 1960s, a group of girls go with their teacher, Miss Renshaw, to the gardens, supposedly to write poems. While there, Miss Renshaw invites them to talk with the gardener, a conscientious objector named Morgan, who is himself a poet. Morgan leads the girls and Miss Renshaw into a nearby cave, supposedly to explore aboriginal paintings. The girls come out of the cave, but Miss Renshaw never reappears. Forever linked by their teacher’s disappearance, the eleven girls in Miss Renshaw’s class struggle to make sense of her fate, even years later when they finish their time at school. There is no real way to capture the haunting beauty of this book in a simple synopsis. While the plot is significant, what makes this book remarkable is the beauty of the language and the author’s eerie, otherworldly tone. I was with the girls in every moment of the story. I could envision every moment, from their innocent gathering under the tree with Morgan, to the loss of one of the girls’ hats on the hike to the cave. Later, when they return to school, I felt as though I could hear the footsteps of teachers and administrators climbing the stairs to Miss Renshaw’s classroom. I could see their concerned faces, and feel the guilt the girls felt as they were torn between keeping a secret and helping to possibly save their teacher. The book took over all of my senses, and I felt like I was swimming in it, enjoying wave upon wave of its gorgeous prose and psychologically compelling storyline. Adult readers might find that Miss Renshaw is similar in some ways to Miss Jean Brodie from the Muriel Spark novella and the film based on it. Indeed, I imagined Maggie Smith in the role of Miss Renshaw almost the entire time I was reading, and though the content of this story is not as mature, Miss Renshaw and Miss Brodie are both equally unsettling figures. 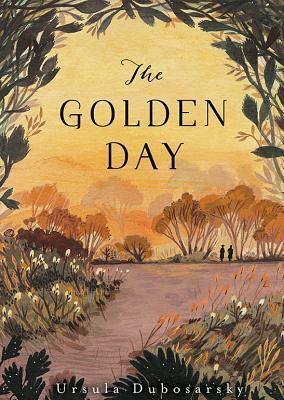 I actually think The Golden Day is such a sophisticated novel that adults can enjoy it just as much as kids. Though the characters are roughly the equivalent of fourth graders for most of the story, I think the best audience for the book is actually slightly older. Middle school readers, especially, will be drawn to the creepy mood of the story, and the moral implications of Miss Renshaw’s behavior. I think this would be an interesting book to read aloud, or to discuss in book clubs. When I finished the book myself, I instantly wanted to know other readers’ opinions on it, and I suspect young readers will feel the same way - especially given the story’s unexpected and ambiguous conclusion. The Golden Day is one of the best books I’ve read in 2013, and it’s likely to stick with me for a long time to come. Though it’s not eligible to win the Newbery because the author is not a U.S. resident, it is just as distinguished as any book that has won Newbery recognition, and I recommend it very highly to readers from grade 5 to adulthood. 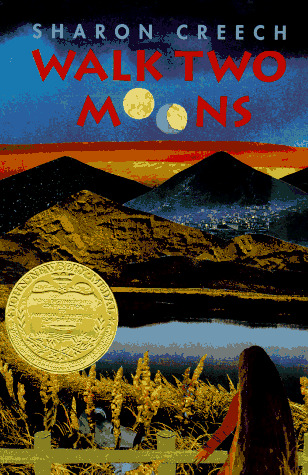 If you had asked me in 1995 (when I was 12) what my favorite book was, the answer most likely would have been Walk Two Moons by Sharon Creech. Though I think I only read it once, I remember just falling in love with it, and even now, it’s a book I identify as a favorite when kids ask me what books I loved as a kid. Surprisingly, despite my devotion to the book for nearly 20 years, when I sat down to think about it, I didn’t have very many memories of it at all. I remembered the main character’s name, Salamanca Tree Hiddle, and that she and her grandparents are on a road trip to find Salamanca’s mother, and that they call Sal their “chickabiddy,” but these are basically the only details my mind held onto. I’d forgotten that the road trip is only half the story, and that Salamanca actually narrates another story as she travels with her grandparents. The tale is that of her friend, Phoebe Winterbottom, Phoebe’s mother, and their involvement with an apparent lunatic. I didn’t enjoy the story itself as much. I appreciated the quality of the writing more. There is a lot of metaphor at work in this book, which I understood much more easily as an experienced adult reader. While I remember liking the sentiment of not judging someone until “you’ve walked two moons in his moccasins,” I never realized the many ways Sal does just that throughout the book. Sal not only takes the same literal trip her mother took from Kentucky to Idaho, she also learns to feel empathy for Mrs. Cadaver, her father, her grandparents, Phoebe Winterbottom, and even Phoebe’s mother. I don’t think I could have articulated all of that as a seventh grader, even if I internalized it, and it impressed me how well Creech weaves together the various parts of this story. I especially liked the parallels between Sal’s mom leaving home and Phoebe’s mom leaving home. The story itself also seems more predictable to me now, possibly because I read and analyze so many children’s books. I didn’t remember the details of the plot, but as each event unfolded, I could see where things were going. I also think I am just a more careful reader now than I ever was as a kid, because my child self was shocked to learn that Sal’s mother is dead, but my adult self picked it up early on, the first time Sal says her mother is “resting peacefully.” I can’t tell whether the author intends for the reader to know this information early in the story or not - but it was interesting how obvious it was to me now and how clueless I was back then. Re-reading this book was kind of a personal let-down because the story didn’t inspire the same strong sense of excitement I remember from back in the 90s, but without regard for my nostalgia, I think the story still holds up very well. As Newbery winners go, it’s one of the more readable stories, and I think kids are still drawn to this book - and Creech’s writing in general - even as we approach the 20-year mark since Walk Two Moons was first published.I doubt this is a book I’ll feel any need to revisit again, but I’m glad to have a new perspective on what was once my favorite book in the world.